The most modern and accurate grain analyser available. 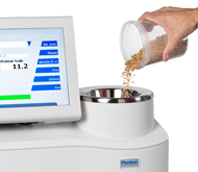 Perten Instruments is the favored company in grain quality testing and has made near Infrared grain analyzers for thirty years. The Inframatic 9500 is the latest Inframatic model, and offers the best accuracy on the market.It is reliable and strong, engineered to satisfy the necessities of grain handling operations and analyzes a large variety of grains and oilseeds for moisture, protein, oil and plenty of other parameters in less than one minute. 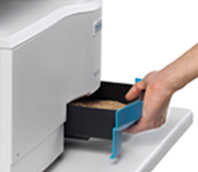 The Inframatic 9500 is intended to be used at grain receivals and grain labs. this suggests that it will face up to harsh environments and rough handling, that it is easy to use, and that it has options that match the requirements of grain labs. Select the type of grain to analyze. 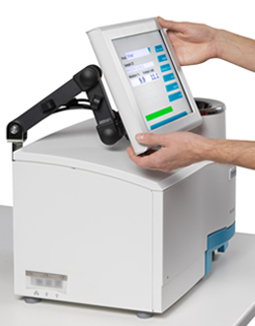 Pour the sample and press “Analyze” After analysis, results are displayed on the screen, and the sample box can be emptied. Analysis takes less than a minute, and the results are shown on the large display. The position and angle of the display may be adjusted to fit your desires. Move it up or down, back or forward, left or right, to optimize its position for the operator. Tilt it left, right, up or all the way down to read the results from wherever it’s most convenient. The Inframatic 9500 was designed with modern electronics and also the highest exactness optical elements, guaranteeing the best attainable information quality. Combined with the utilization of advanced chemometrics techniques, the result is unequaled accuracy. Stable scanning grating optics and reliable calibrations guarantee that you can continually get the proper results. The sturdy construction of Inframatic 9500 with sealed module construction of standardized elements guarantees long run dependableness and makes the instrument nearly maintenance free. 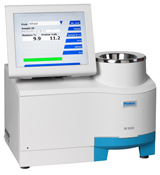 The short analysis time combined with the easy sample handling makes the Inframatic 9500 one among the quickest whole grain NIT analyzers within the market. When grading grain it’s necessary to possess full management over the calibrations utilized in every instrument and to be ready to monitor performance in just about real-time. By using local area network, the administration of the network can continuously be accessible twenty four hours every day no matter the placement of the instruments. a large range of Inframatics are operated in networks globally. The optics house is machined out of a solid piece of metal, that guarantees all instruments to be just like one another. so calibrations are totally transferable and all Inframatic 9500 units turn out identical results for constant samples. Wavelength standardization is performed with NIST references, providing full traceability back to measureable standards. 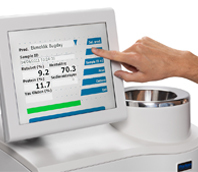 The large color touch screen with its intuitive menus makes it straightforward both to work the instrument, and browse analysis results – even from a distance. we’ve designed the computer program to form analysis as fast and secure as attainable. All the operator must do is to pick which kind of grain to investigate and pour it into the funnel. No manual settings or changes are necessary. 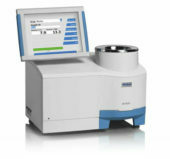 NIR-instrument for quick determination of for instance moisture and protein in powder type or ground samples. Application examples: Grain, Milk powder. Calibrations included: Moisture and protein in wheat and barley. Other calibrations available free of charge. NIR instrument for rapid and accurate analysis of flour and ground products. Suitable for example for determination of ash, protein and moisture in flour and protein and moisture in ground grain. Equipped with 7 filters.